This afternoon I found a stash of unprocessed wheat bran in the freezer, and since I haven’t made any in a while, I used it in some bran muffins. 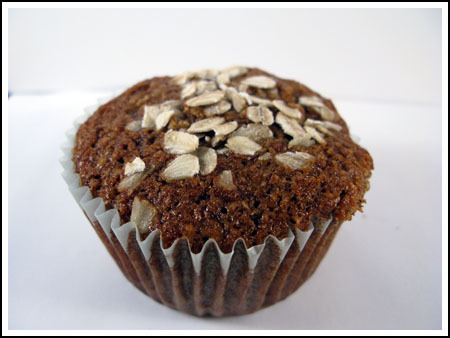 My favorite bran muffin recipe is probably this one from Epicurious, but this one’s good too. It’s adapted from Joy of Baking. Below is a half batch of the original with some small changes. I used salted butter, soaked the bran in coffee instead of water and doubled the vanilla. Also, instead of baking the batter as needed, I just baked all the muffins at once. These didn’t rise very much, but they were dense and sweet and Fuzz and her friend gobbled them up. Preheat oven to 375 degrees F (190 degrees C). Line a 6 cup muffin pan with paper liners or spray with cooking spray. Combine bran and coffee. Set aside. Cream the butter and brown sugar with an electric mixer. Beat in the egg, vanilla and molasses. Beat in the bran. Mix together the flours, oats, cinnamon, salt, baking soda and powder. Combine the milk and buttermilk (or soured milk). Add the flour mixture, alternately with milk, to the bran mixture, beginning and ending with the flour mixture. Fill the muffin cups almost to the top, sprinkle with some oats to garnish (if desired), set pan on a cookie sheet and bake for about 20 minutes or until a toothpick inserted into the center of a muffin comes out clean. Remove from oven and place on a wire rack to cool slightly before serving. Shannon, thanks for the feedback and the tips on cutting the fat. I wanted to cut back the fat a little, so I used 1 TBSP butter and 3 TBSP applesauce. I also subbed 1/2 tsp almond extract for the vanilla extract, added 1/2 cup toasted slivered almonds to the batter, and used all buttermilk instead of the regular milk. I ended up with enough batter for 10 decent sized muffins. I think I finally nailed a good Morning Glory muffin, but completely forgot about thinking about adding molasses. Anywho, these look good. I crave a good healthy muffin for heavy-work mornings. These look really good. I’m so glad that Fuzz and her friend liked them! I made these this morning and DID soak the bran in 1/2 cup of gingerbread hot cocoa. Besides using all whole wheat pastry flour, those are my only changes. I filled 12 muffins cups. These muffins are perfectly moist and delicious! The best bran muffins I’ve had. Those muffins look great — so hearty! I love that there’s coffee in them too. I’d like to try these with oat bran! Ooh, maybe soaking the bran in hot cocoa, now THERE’S an idea! 😉 Seriously though, I just might make these this morning. One can never have enough chocolate chip cookie recipes OR bran muffin recipes in my opinion. I too like the coffee idea. Terrific. Mmm, these look delicious and I LOVE the idea of soaking the bran in coffee!! Genius. I love a good bran muffins. It’s a sweet treat that you don’t feel too guilty about eating. Great job! I can’t wait to try out this recipe. Yeah, I thought of you while I was soaking the bran in coffee ;). Ahh, yum. That’s an interesting concept, to soak the bran in coffee. Still, I’d use water and think these look/sounds great!